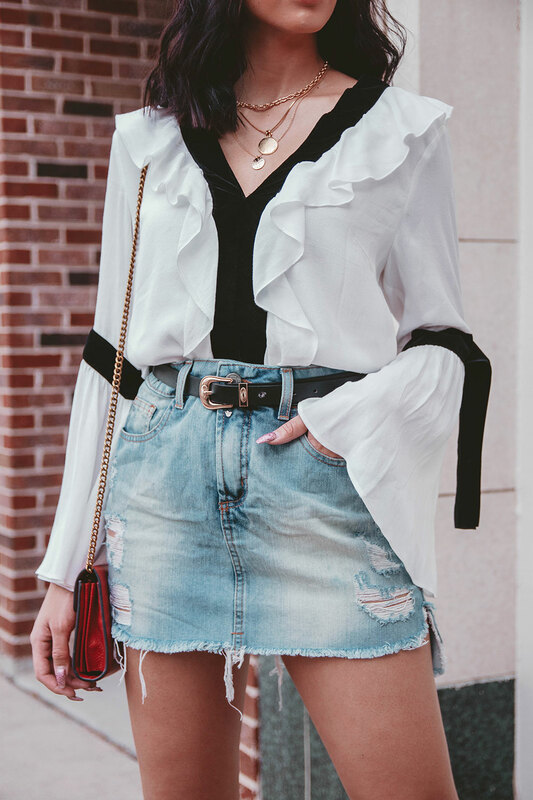 Off the shoulder was the style of the summer, but now that summer is coming to an end bell sleeves (also known as flare sleeve tops) are the style of this fall and winter. This cute piece is versatile and goes well with a nice pair of jeans, dress pants, and skirts. It’s okay to let summer live on into fall or even embrace fall early! For a cool and refreshing look, you can wear a white bell sleeve shirt with a denim skirt, like I did. Using accessories would also be a good idea to implement the look. Can’t go wrong with accessories, right? Compared to an airy casual summer white t-shirt and denim short outfit, this is a lot more elegant and ladylike. No doubt why I love bell sleeve tops.